The great astrometrist Peter van de Kamp discovered exoplanets orbiting the second closest star to Earth (after those in the alpha Centauri system) in the 60’s. Barnard’s star — famous among astronomers both for its proximity and its record high speed with which it moves across the sky (“proper” motion) — is about 6 light years away, but is so small and cool that it requires a telescope to spot. It moves about 10 arcseconds (1/600 of a degree) every year with respect to background stars, meaning that astronomers looking for it must actually calculate where it is this year or they might not be able to find it in their telescope’s small field of view. Time lapse image of Barnard’s star moving across the background sky by the Backyard Astronomer. Click through for an animated gif. 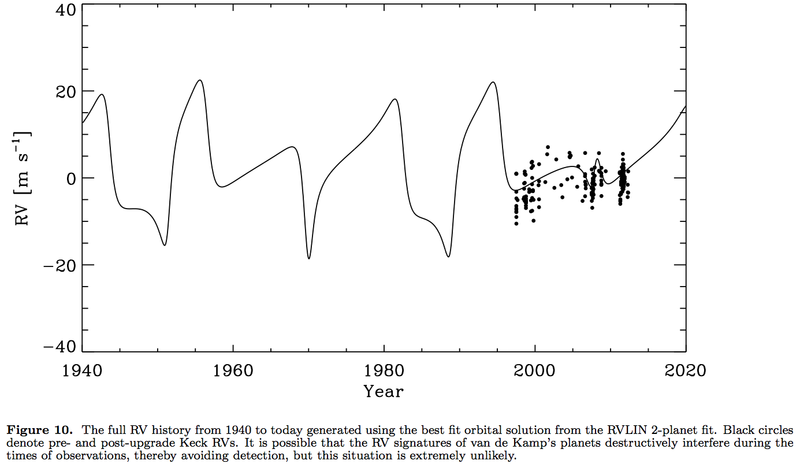 In 1986, before any substellar companions had been discovered (Latham’s detection of HD 114783b would be published two years later), Van de Kamp published a book on “dark companions” to nearby stars, in which he summarized the results he had accumulated over the decades. He detected these companions by tracking star’s motions very carefully as they moved. He noticed that Barnard’s star seemed to travel in not just a straight line, but to wobble back and forth along its path. Most of this motion was due to parallax — as the Earth orbits the Sun our light of sight to Barnard’s star changes slightly, and so it seems to make an annual wobble with a full amplitude of about 1 arcsecond. But van de Kamp saw residuals to this motion, and in 1963 attributed them to the presence of a planet orbiting Barnard’s star. Van de Kamp reasoned that the planet was basically tugging on Barnard’s star as it went around, causing this wobble. The measurements van de Kamp were making were very difficult. Tracing a path across the sky to this level of precision over many decades is almost impossible with photographic plates. One clue that something might be wrong was that the orbital solutions he found kept changing. First he had detected a single companion with about one full orbit, but as he collected more data he had to first alter the orbital solution, then later add a second planet to the solution in order to make sense of the residuals. The fact that his models never seemed to properly predict the future residuals was a clue that perhaps his error bars were underestimated and he was just fitting noise. Attempts to reproduce van de Kamp’s measurements did not succeed. Gatewood & Eichhorn and Bartlett tried and failed to detect these telltale residuals from archival plates, and an astrometric study with the Hubble Space Telescope similarly came up empty. The consensus is that van de Kamp was mistaken. Still, there is always the possibility that it is the modern astronomers, not van de Kamp, who are not being careful enough. This is especially true since the orbital periods of the purported planets (around 12 years and 20 years) are so long and the orbital parameters so uncertain that it takes years of observation to completely confirm or refute all possible planets consistent with van de Kamp’s solution. 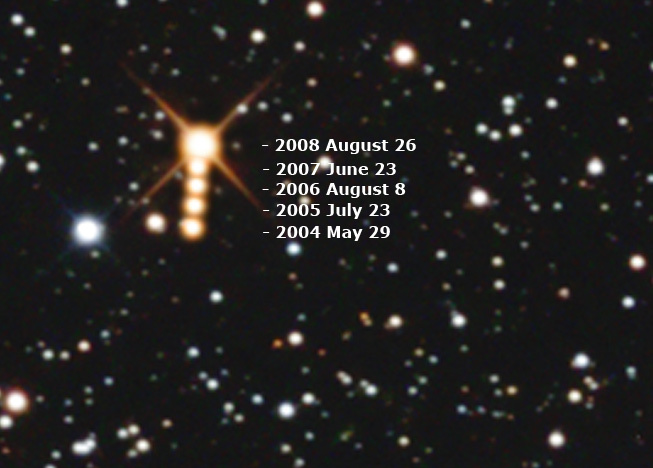 Barnard’s star has been on the California Planet Survey programs at Lick Observatory since 1986 and at Keck Observatories since 1997. Our velocity precision is better than 5 m/s at Keck, and even at Lick our early precision was sufficient to detect van de Kamp’s planets, if they were in an edge-on configuration. 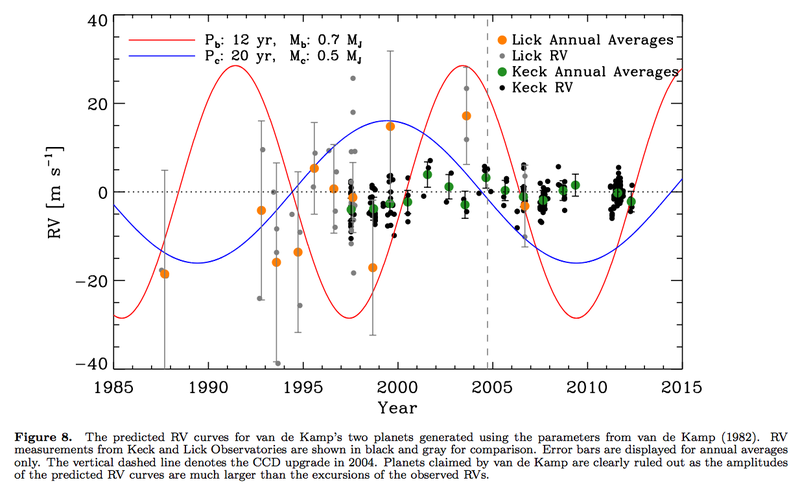 In a paper out on astro-ph today Berkeley student Jieun Choi and Geoff Marcy show that these decades-long radial velocity data sets firmly rule out van de Kamp’s planets, or really any gas giants orbiting Barnard’s Star within 5 AU. We actually bent over backwards to make the purported planets fit the data. We ignored van de Kamp’s measurements of eccentricities and phases for the planets and found a 2-planet solution with the proper periods where the two planet signals destructively interfere for the duration of the Keck observations. This means that in principle a pair of planets with those periods could have evaded detection, but only if the system is almost face-on (i > 160 degrees) so the planets produce a signal too small for us to see. Such a face-on configuration is technically within van de Kamp’s error bars for the inclination, but the phases and eccentricities are quite contrived, and not necessarily consistent with the putative planets’ orbital parameters. So this is all but a dispositive null detection of van de Kamp’s planets (and, combined with the modern-day astrometry, I would say these null detections are truly dispositive). …Peter van de Kamp remains one of the most respected astrometrists of all time for his observational care, persistence, and ingenuity. But there can be little doubt now that van de Kamp’s two putative planets do not exist. This entry was posted in science, Uncategorized and tagged science on August 14, 2012 by jtw13.